Just a couple of photos from the last few days. I went into Kutchan to do some shopping the other day. I took the bus in and then got a lift back with some Japanese people I had met last year at the hostel. On the way to the bank, there were some workmen putting down some new asphalt in a parking lot. I just love construction scenes so I had to get a shot of the boss throwing snow on the hot asphalt to cool it off. This is the best of a bad lot of photos shot with the point and shoot. It was also overcast and snowy, so that is my excuse. doh! This evening I went for a walk to the Lawson konbini and on the way an ambulance came wailing past. I guess I am an ambulance chaser. Here we go again. Another year bites the dust. This has been a strange year. 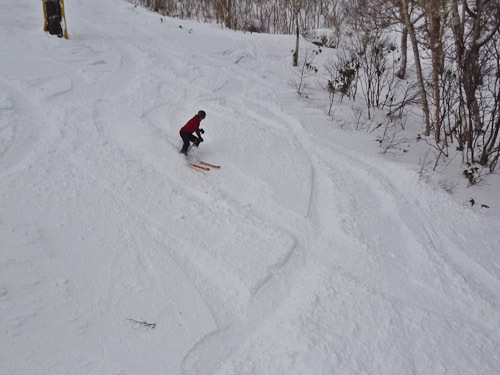 I started it off in Japan skiing in Niseko, Hokkaido. At the end of the Japanese trip, I took my yearly visit to Osaka castle to photograph the birds around the grounds. This Grey Heron is usually found in the pond below the castle. Back in Australia, I headed north and took some surfing photos along the way. Further north around Laurieton, I shot this photo of a Yellow-tailed Black-cockatoo walking out the headland at Dunbogan. Heading into Queensland on the way to Mundubarah, I stopped in at Ban Ban Springs and got some great shots of the Red-backed Fairy-wrens. Then back south to the Kosciusko National Park for the winter. During which time I took a trip to the beach for a bit of a holiday and got some great shots of Eastern Whipbirds at Gillard Beach. Then full circle back to Japan. Now I am back in Japan in Hokkaido for another season of powder snow hunting. It is a massive change from the hot beach to the freezing cold snow. One day I am in Sydney where the temperature is going to hit forty degrees Celsius and a few days later the temp is hovering around zero. I stopped at Karuah on the way up to Forter about a week ago. It is a nice relaxing spot by the river. Plenty of time to read and walk along the water-front. This Praying Mantis came around while I was trying to cook some lunch near Wallis Lake at Forster. I had to stop making lunch and get the camera out! The nerve of this wild-life. It was raining in Osaka so I did not go around doing the tourist thing. Our flight was delayed because of lightning. Flying over the coast of Hokkaido. Touched down at Sapporo and caught the bus to Niseko. I slept like a log last night.